Nationwide leader in commercial roofing attends Roofing Day in Washington D.C.
Roofing Day in Washington, D.C.
“It was great to see such a large segment of the roofing industry in Washington to express real concerns about our future workforce needs and the impact of regulations on our people." Said Mark Santacrose, President, and CEO, Tecta America Corporation. NRCA Roofing Day brought together roofing professionals from throughout the U.S. for the first and largest advocacy event of its kind dedicated solely to the roofing industry. The roofing industry came together in Washington, D.C., to meet with members of Congress and their staffs. 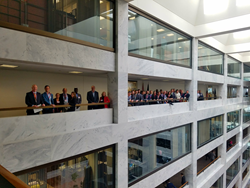 Tecta America sent ten employees as part of the 450 roofing professionals from 48 states that participated in meeting with 87% of the Senate and House representatives at the Capitol. Employees from Tecta America were able to discuss and educate our Senators and Representatives of the need for regulatory reform, immigration reform, and workforce development affecting the roofing industry. “It was great to see such a large segment of the roofing industry in Washington to express real concerns about our future workforce needs and the impact of regulations on our people. As an industry, we are committed to building our great workforce and continuing to provide exceptional value to the critical infrastructure and construction needs of our country but need political solutions that help, not hurt, those efforts. We believe strongly in border security, but also immigration and educational policies that help us address our workforce needs going forward. Congratulations to Reid Ribble and NRCA for organizing such an impressive industry-wide effort”, said Mark Santacrose, President, and CEO, Tecta America Corporation. What an exciting privilege it was for Tecta America to participate in such a historic day for the roofing industry.